Atrial fibrillation often prevents the delivery of optimal CRT therapy due to the irregular conduction to the ventricles. To promote consistent and effective CRT pacing, the EffectivCRT™ During AF feature makes adjustments to the pacing rate based on the morphology of the left ventricular electrogram (LV EGM) following biventricular (Bi-V) or LV-only pacing. 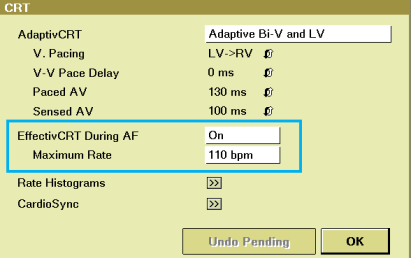 For diagnostic information on effective CRT during AF see the EffectivCRT Diagnostic feature. This feature can be found in some Medtronic CRT-P and CRT-D devices. Please go to manuals.medtronic.com or consult with your local Medtronic representative regarding device models available in your geography. The EffectivCRT™ During AF features is shipped On in the device. The maximum rate is restricted by the programmed Maximum Rate. This value is the same as the Conducted AF Response Maximum Rate value. The EffectivCRT™ During AF feature is available when the pacing mode is programmed to DDD, DDDR, or VVIR. However, it operates only in nontracking modes. Therefore, when the device is programmed to DDD or DDDR mode, the EffectivCRT™ During AF feature operates only during a Mode Switch to DDIR mode. 1. When the EffectivCRT™ During AF feature is set to On, the Conducted AF Response feature is automatically set to On. 2. 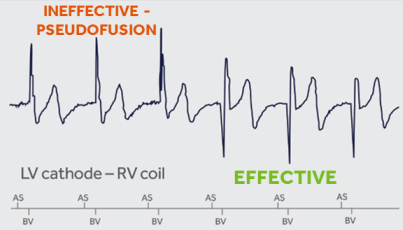 When the EffectivCRT™ During AF feature is set to On, the EGM3 source is set to the LV pacing cathode to RVcoil. 3. 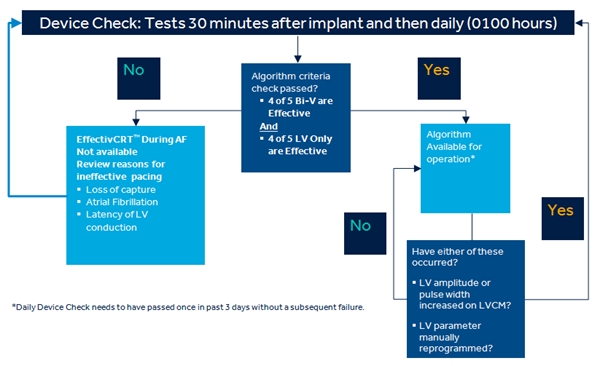 If the LV Capture Management™ (LVCM) is Off, it will default to Monitor when the EffectivCRT™ During AF is set to On. 4. If the V. Pacing parameter is set to RV→LV, it is set to LV→RV when the EffectivCRT™ During AF is set to On. In patients with intact AV conduction, atrial fibrillation (AF) conducts irregularly to the ventricles. Although optimal CRT therapy requires consistent and effective CRT pacing as much of the time as possible, the presence of AF commonly prevents the delivery of optimal CRT therapy. To promote consistent and effective CRT pacing, the EffectivCRT™ During AF feature makes adjustments to the pacing rate based on the morphology of the LV EGM following Bi-V or LV-only pacing. The example below illustrates the difference between effective and ineffective CRT pacing as seen by the change in morphology on the electrogram. Effective CRT paced beats are identified by having negative deflections, whereas, ineffective CRT paced beats have positive deflections. Note that all 6 beats are identified as bi-ventricular events. For the first 30 beats of EffectivCRT™ During AF operation, the device adjusts the pacing rate based on a beat-by-beat evaluation. The device increases the rate after each sensed or ineffective CRT paced beat and decreases the rate after each effective CRT paced beat. After the initial 30 beat phase, the device alternates between a 10 beat evaluation phase and a 30 second maintenance phase. 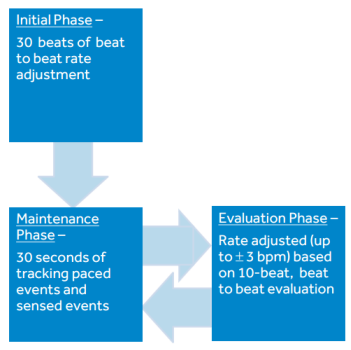 Following the 10 beat evaluation phase, the device adjusts the pacing rate based on the current pacing rate and the number of effective CRT paces delivered during the phase. During the 30 second maintenance phase, the device maintains the current pacing rate. If a series of ventricular events occurs with a number of ventricular sensed beats, the device immediately reenters the 10 beat evaluation phase. Otherwise, the device reenters the 10 beat evaluation phase following the 30 second maintenance phase. 4 out of 5 LV-only paced beats are effective. Similar to the Conducted AF Response feature, the EffectivCRT™ During AF feature is designed to promote CRT delivery during AT/AF episodes. Conducted AF Response increases the pacing rate based on sequences of paced and sensed events, while EffectivCRT™ During AF adjusts the pacing rate based on the percentage of effective CRT pacing. When the device is unable to identify effective CRT pacing under ideal conditions during the EffectivCRT™ daily device check, the devices switches from EffectivCRT™ During AF operation to Conducted AF Response operation. The daily device check must pass before EffectivCRT™ During AF operation can resume. LV loss of capture is suspected. The daily EffectivCRT™ device check, which tests the ability of the device to detect effective CRT pacing under ideal conditions, fails or does not complete successfully at least once in 3 days. LV amplitude is less than 0.5 V greater than the last measured LVCM threshold. LV amplitude has increased since the last successful daily EffectivCRT™ device check. 5 or more beats are paced at the Maximum Rate, at least 4 of the 5 beats indicate ineffective CRT pacing, and the sensor rate is at least 10 bpm below the Maximum Rate. If the device suspends EffectivCRT™ During AF operation, it reinitiates EffectivCRT™ During AF operation once the next daily EffectivCRT™ device check passes. Note: EffectivCRT™ During AF operation is suspended during tachyarrhythmia therapies, system tests, EP study inductions, manual therapies, MRI SureScan operation, and emergency fixed burst, cardioversion, and defibrillation therapies. EffectivCRT™ During AF operation is not suspended during an impedance test or a Charge/Dump Test. The EffectivCRT™ Diagnostic feature determines the percentage of effective CRT pacing by evaluating the morphology of the LV pacing cathode to RVcoil EGM. This information can be found in several places. Rate Histograms show the percentage of effective and ineffective CRT pacing during AT/AF episodes. Cardiac Compass™ Trends displays AT/AF total hours/day, the percentage of ventricular paced beats/day and the percentage of effective CRT pacing/day. In addition, the device collects and stores the 5 most recent EffectivCRT™ Episodes, including markers and an indication of which ventricular paces were effective. See the EffectivCRT™ Diagnostic feature for more information. patients who were paced less than 80% received the greatest benefit (average absolute increase of 15% effective pacing during AF). The EffectivCRT Diagnostic: What Is It and How Does It Work? Mittal S, et al. A Novel Algorithm Increases Effective Left Ventricular Pacing During Atrial Fibrillation in Patients Undergoing Cardiac Resynchronization Therapy: Primary Results of the Randomized CRTee Trial. Presented at ESC Congress 2016.